Researchers from The University of Texas at Austin have developed a new technique to capture three-dimensional images of structures in biological materials at a much higher resolution compared to other existing methods under natural conditions. The technique may provide insights into how cells communicate with each other and help engineers to grow artificial organs such as the heart or skin tissue. The research findings are published in the journal Nature Communications. The Ernst-Ludwig Florin-led researchers used their thermal noise imaging technique to capture nanometer-scale images of the collagen fibril networks. Collagen fibrils are part of the connective tissue found in the animal skins. A nanometer is a unit of measurement that is one billionth of a meter or approximately one-hundred-thousandth width of a human hair. By exploring collagen fibrils at the nanometer scale, researchers were able to measure key properties that influence the skin’s elasticity, which could lead to better designs for artificial tissues or skin. Capturing 3D images of nanoscale structures in biological samples at a much higher resolution is difficult, as the structures are likely to become soft and bathed in liquid. This indicates that even small fluctuations in heat can cause structures to move backward and forward. This effect is known as Brownian motion. In order to control the blurriness caused due to this effect, other super-resolution imaging methods often "fix" biological samples by combining chemicals that harden different structures, where materials lose their mechanical properties. Researchers can also control blurriness by focusing on stiff structures that are fixed to a glass surface without fixing the samples, but this may severely limit the type of configurations and structures they analyze. In the research, Florin and his team used a different method to make an image. They added nanospheres – nanometer-sized beads that reflect laser light – to their biological samples in natural conditions, shined a laser on the sample and gathered superfast snapshots of nanospheres observed through a light microscope. According to the researchers, the thermal noise imaging method works similar to this analogy: Imagine you want to take a 3D image of a room in complete darkness. 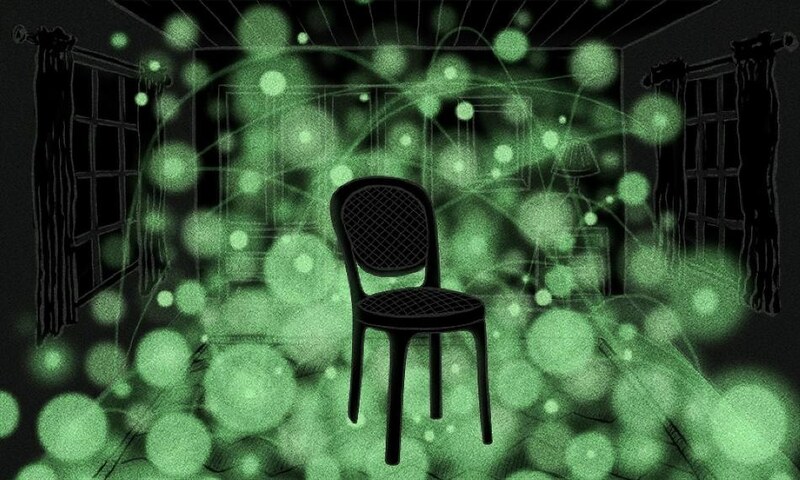 If you were to throw a bright rubber ball into the room and use a camera to capture an array of high-speed images of the bouncing ball, you would notice that when the ball bounces around the room, it is not able to go through hard objects such as chairs and tables. By bringing together millions of images taken at high speed that they do not blur, you would be able to make a picture of where objects are in the room (wherever the ball was not able to go) and where objects are not (wherever the ball could go). In the thermal noise imaging method, the rubber ball is equivalent to a nanosphere that moves around in a biological sample through natural Brownian motion – the similar uncontrolled force that has caused continual trouble to other microscopy methods. This chaotic wiggling is a nuisance for most microscopy techniques because it makes everything blurry. We've turned it to our advantage. We don't need to build a complicated mechanism to move our probe around. We sit back and let nature do it for us. In 2001, the initial concept for the thermal noise imaging method was published and patented, however, this was not developed into a fully operational method until now because of technical challenges. The researchers used the tool to measure collagen fibrils’ mechanical properties in a network for the first time. Collagen is a biopolymer that creates scaffolds for cells in the skin as well as contributes to the skin’s elasticity. Researchers are still not certain about how the architecture of a collagen network cause its elasticity. This is a vital question that has to be answered in order to design artificial skin. If you want to build artificial skin, you have to understand how the natural components work. You could then better design a collagen network that acts as a scaffolding that encourages cells to grow in the right way. Tobias Bartsch, a former graduate student at UT Austin and presently a postdoctoral associate at The Rockefeller University, is the first author of this research paper. Other co-authors include Emanuel Lissek, Janina Lange and Martin Kochanczyk. The Simons Foundation and the National Science Foundation provided funds for this research.